A functional beverage is usually meant to offer certain health benefits to consumers. Most functional beverages contain some vitamins, minerals, vegetables, and fruit purees. Some examples of functional beverages include energy drinks, performance drinks, and enhanced fruit drinks. Greater consumer awareness coupled with a high disposable income ensures that developed regions such as North America remain the largest markets for functional beverages for some time to come. Banana puree can be a major ingredient in functional beverages and this directly benefits the global banana puree market. An incremental dollar opportunity of almost US$ 85 million for the period from 2017 to 2027 is waiting to be tapped in the beverage segment of the banana puree market. An ever-increasing number of women are joining the global workforce every year, leading to booming demand for baby nutrition foodstuffs. Baby nutrition food comprises baby yoghurt, easy-to-digest cereals, oatmeal, baby led weaning, etc. Baby yoghurt and cereals often have fruit purees of different flavours as the primary ingredient. The infant food segment has been growing at a rapid clip because of the widespread use of banana puree in the production of a number of finished foods. The infant food segment is anticipated to be worth approx. US$ 250 million by end 2027, making it the largest segment in the banana puree market. Consumers seek out beverages that deliver them maximum health benefits based on sound reasoning and facts. Unfortunately, they are quite sceptical of the tall claims made by prominent beverage manufacturers now and this can create a certain degree of hesitation and confusion concerning ingredients of functional beverages marketed aggressively. On account of the lower emphasis on product safety and labelling, false health claims by manufacturers to sell their wares have risen exponentially, posing a challenge to banana puree market growth. The bakery industry has undergone substantial changes because of higher disposable income, health concerns, and a demand for convenience food products. The traditional packaged baked goods category is facing intense competition from convenience food. The bakery industry consists of delicious foods such as breads and rolls, pizzas, biscuits, and baked desserts. Banana cakes are very popular amongst European consumers in particular and these cakes are made from banana puree. 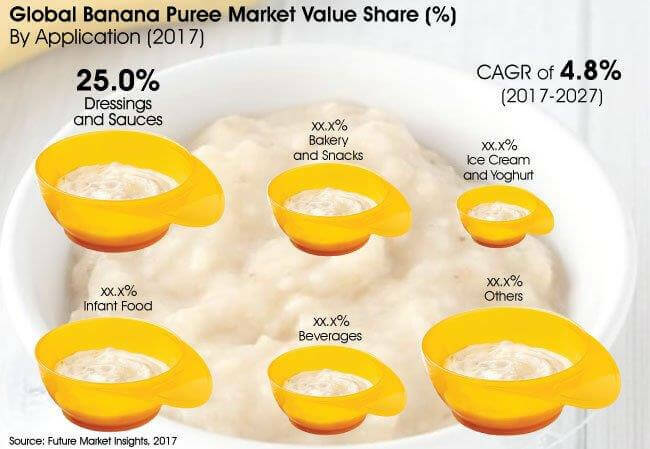 The bakery and snacks segment had a market share of almost 12% in the global banana puree market in 2017 and is anticipated to lose 66 BPS over the course of the forecast period. Cosmetics Europe estimates the Europe personal care and cosmetics market to have a value of US$ 90 billion at 2016 retail prices. Several cosmetic conglomerates such as Procter & Gamble, Unilever, and L’Oreal Group have invested sizeable funds in the region, and are introducing innovative products that have fruit ingredients. For e.g. – Body Shop International, a subsidiary of L’Oreal Group has introduced a banana shampoo with banana puree as a key ingredient. Cosmetics is a part of the Others segment in the Western Europe banana puree market and is poised to have a volume of more than 2400 MT by end 2027. Future Market Insights provides a comprehensive study on the banana puree market with a forecast of its global and regional prospects. The report titled ‘Banana Puree Market: Global Industry Analysis (2012–2016) and Opportunity Assessment (2017–2027)’ has an exhaustive analysis with several insights on the banana puree market for a decade from 2017 to 2027. The historical revenue figures of key stakeholders in the banana puree market for the previous five years has been collated and considered the baseline for assessing revenue share and market size. The report comprises a range of macroeconomic factors that impact the expansion of the banana puree market as a whole, including industry-wide trends, growth drivers, acute restraints, and untapped opportunities. Recent developments of market players have been evaluated to gauge the growth of the banana puree market till the present with a prognostic analysis of the market’s future. The report additionally incorporates information on changing customer tastes and requirements that can potentially transform the production and supply in the banana puree market. An important chapter in the banana puree market report highlights the segmental analysis with a forecast of the banana puree market. The banana puree market has been studied on basis of application, process, source, and region. Along with a segmental analysis of the following, the report has country-specific data points with cross-sectional assessment and forecast. To cover the entire global banana puree market, the report is prepared with a fragmented structure in place. The report executive summary delivers an abstract of important findings with a special focus on major regions in the banana puree market. The report overview is a formal introduction to the banana puree market with an easy-to-understand definition, a précis on annual growth rates and market size evaluation. The taxonomy of the banana puree market is also provided herein. Furthermore, the report highlights the raw material sourcing strategies, cost pricing and structure, supply chain management, and distribution network. The intensity map demonstrates the presence of participants across countries in the banana puree market report. Key stakeholders in the banana puree market are profiled in the report in the form of long and short-term strategies, recent developments, and financial ratios to understand the competitive landscape incumbents and new market entrants can expect. Taking into account the volatile global economic scenario across different regions and the characteristics of the banana puree market, the expert team at Future Market Insights have deployed a unique and highly robust methodology underpinned by extensive research. Quantitative data is gathered from company press releases and authoritative databases that are rigorously analysed by way of custom-designed calculations and formulas. Qualitative insights are seamlessly fused with this to deliver a fact-based and conclusive forecast of the banana puree market for the next decade. Important metrics such as absolute dollar opportunity, Y-o-Y growth and CAGR have been used to great effect to interpret market size and findings. In order to cater to a global clientele, the values provided throughout the report are in US dollars. The primary objective of the report findings is to assist market participants in devising go-to-market strategies and strengthen their position in the banana puree market. 18.4.7. The Kraft Heinz Co.
18.4.13. Shimla Hills Offerings Pvt. Ltd.
18.4.15. SunOpta Grains and Foods Inc.